The term “covetousness” is likely unfamiliar to younger generations today. However, it is a sin considered so grievous by God that He included it in His Ten Commandments to Israel. “You shall not covet…anything that is your neighbor’s” (Exodus 20:17). Envy, lust, and greed all convey aspects of the core biblical meaning, but it essentially boils down to a wrongful desire for wealth and possessions that belong to another. It has been said that the command against covetousness may be the most difficult to obey. Perhaps that’s why, after condemning murder, adultery, theft, and lying (each progressively harder to follow and easier to hide), God left the sin of covetousness for last. Indeed, Christ Himself warned against it when a man asked for His help in settling a family inheritance dispute. “Take heed and beware of covetousness,” cautioned the Lord Jesus, “for one’s life does not consist in the abundance of things he possesses” (Luke 12:15). He then taught the parable of the rich man who, rather than blessing others in need with his overflowing bounty, planned to build bigger storehouses to enjoy it all for himself. But God called the rich man a fool and took his soul that very night, asking him who would own his wealth thereafter. “So is he,” Christ concluded, “who lays up treasure for himself, and is not rich toward God” (Luke 12:21). How do we become rich toward God? By accumulating incorruptible “treasures in heaven” that are pleasing to Him (Matthew 6:20). God’s pleasure is key, and in His great Sermon on the Mount (Matthew 5–7), the Lord Jesus gave many examples of attitudes, service, and sacrificial giving that please God. Interestingly, not one of them encourages the pursuit of affluence and prosperity. For those who fear that a life dedicated to pleasing God might somehow deprive them of their daily needs, it is remarkable that Christ gave comforting assurances that God would provide. “Do not worry about your life, what you will eat or what you will drink; nor about your body, what you will put on” (Matthew 6:25). Instead, “seek first the kingdom of God and His righteousness, and all these things shall be added to you” (Matthew 6:33). How do we become rich toward God? By accumulating incorruptible “treasures in heaven” that are pleasing to Him. If we are honest with ourselves, this is a hard lesson for Christians to learn in an affluent society such as ours. Yet, lest we bash believers today, the frequent warnings throughout Scripture indicate that all cultures have struggled with the sin of covetousness since time began (e.g., Genesis 31:1-7; Joshua 7:20-21; Proverbs 28:16; Acts 5:1-10; Ephesians 5:5; 1 Timothy 6:6-10). It is far too easy to become possessed by our possessions, and some may even think these possessions are somehow God’s reward for their “godliness.” But Paul warns against those who wrongfully “suppose that godliness is a means of gain”; they are ensnared by “useless wranglings” of “corrupt minds” and are “destitute of the truth” (1 Timothy 6:5). 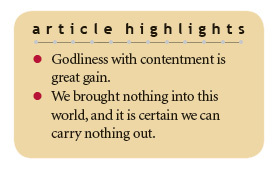 Rather, “godliness with contentment is great gain” in God’s sight. “For we brought nothing into this world, and it is certain we can carry nothing out” (1 Timothy 6:6-7). As we begin another year of service to God, let us cast off any covetous leanings that have crept into our lives and share our resources in the pursuit of everlasting God-pleasing treasure that produces true gain. God has promised to supply all our needs if we are faithful stewards of what He has entrusted to us (Philippians 4:19). Therefore, “let your conduct be without covetousness; be content with such things as you have. For He Himself has said, ‘I will never leave you nor forsake you” (Hebrews 13:5). This final assurance is truly something to be content about! Cite this article: Henry M. Morris IV. 2018. Godly Contentment in the New Year. Acts & Facts. 47 (1).